Motor proteins in intracellular transport. Many essential cellular functions –- cell division, motility, protein synthesis, intracellular transport, and others –- are driven by motor proteins, a specialized set of enzymes that convert chemical energy into mechanical work. Two motor proteins, kinesin and cytoplasmic dynein, are responsible for the long-range transport of mRNA, proteins, organelles, and signaling molecules along the microtubule cytoskeleton. Active transport by kinesin and dynein is critical for the maintenance of biosynthetic, signaling, and degradative pathways in the cell. Long and highly-polarized cells like neurons are particularly sensitive, and accordingly mutations in kinesin or dynein cause neurodegenerative disease in mouse models and humans. Further, defects in intracellular transport have been linked to many neurodegenerative diseases including amyotrophic lateral sclerosis, Alzheimer’s disease, and Huntington’s disease. How do motors function collectively in teams? 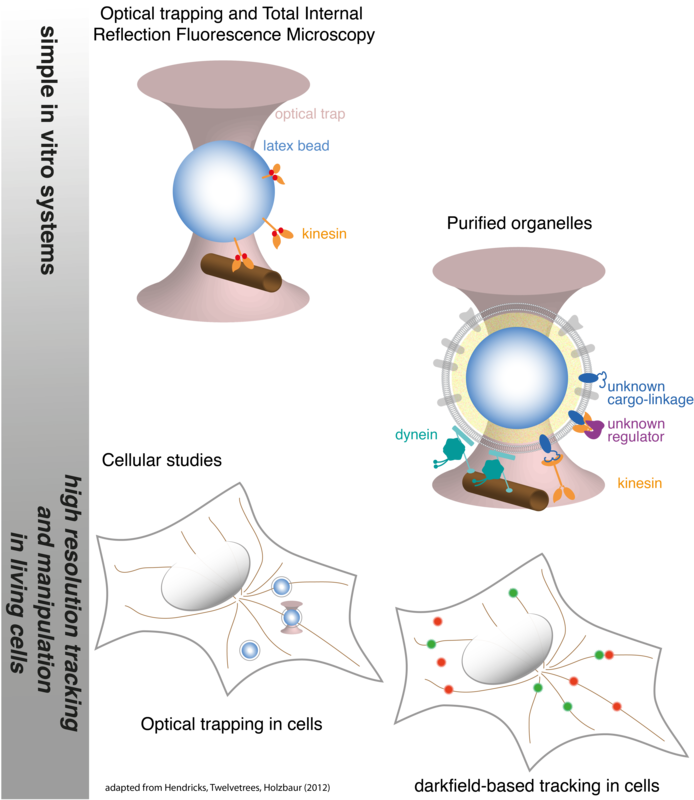 Intracellular cargoes are transported along the microtubule cytoskeleton by teams of minus- and plus-end directed motor proteins. Collective function increases processivity and allows higher forces to be exerted, and may facilitate navigation around obstacles and through dense cytoskeletal networks. Yet, the detailed characterization of single motor proteins has not translated into an understanding of how motors function in groups. How do mechanochemical properties such as force-dependent dissociation kinetics and force-velocity relationships influence the behavior of motors when functioning in ensembles? When interacting with other motors, is the gating or duty ratio of processive motors altered (e.g. does kinesin maintain its strict hand-over-hand walking mechanism when part of a team)? Is the mechanochemistry of some motor proteins, like dynein and kinesin-5, tuned for collective function while motors like kinesin-1 are adapted to function individually? We use a multi-faceted approach that integrates detailed, single-molecule experiments, bulk kinetics, and high-resolution analysis of ensemble behavior to build functional relationships between motor mechanochemistry and collective function, an essential step in understanding how multiple motors interact when transporting intracellular cargoes. How are motors regulated to achieve targeted trafficking? Intracellular cargoes display diverse motility. Late endosomes and lysosomes move bidirectionally while autophagosomes move primarily in the retrograde direction and synaptic precursors display long processive runs in the anterograde direction. 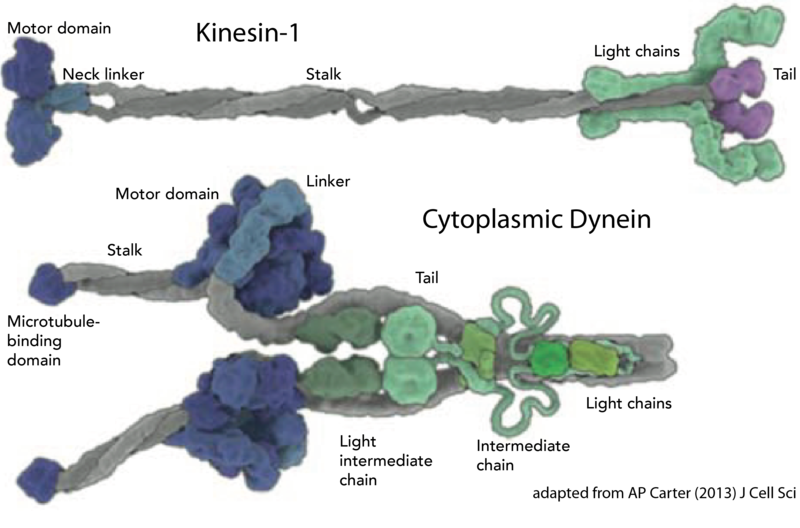 While motility characteristics of intracellular cargoes differ, both kinesin and dynein motors are bound to these cargoes and contribute to their motility, leading to the questions: How are the motors differentially regulated to achieve targeted trafficking in the cell? What mechanisms potentiate changes in motility due to signalling or maturation events? Several regulatory mechanisms are possible–directionality may be biased through modulating (1) the activity of tightly-bound motors, (2) the recruitment of motors to the cargo, (3) the binding kinetics of the motor to the microtubule, and/or (4) motor mechanochemistry, i.e. force production, velocity, duty ratio. We develop advanced optical trapping and tracking techniques in living cells will provide detailed measurements of the motility of intracellular cargoes in response to cellular cues, and will enable us to distinguish between possible regulatory mechanisms. How does the cytoskeleton tune its dynamic mechanical properties? The cytoskeleton consists of a set of biopolymers that maintain the structural integrity of the cell. Through continual remodelling, cytoskeletal dynamics drive changes in cell morphology required for essential functions like cell division and motility. At the same time, actin and microtubules serve as tracks for motor proteins which transport organelles, mRNA, and signalling molecules to maintain signalling, biosynthetic, and maintenance pathways in the cell. The cytoskeleton is not a passive track, instead it actively regulates motor protein function to direct intracellular traffic through its organization, post-translational modifications, and binding partners. These diverse roles require the cytoskeleton to tune its mechanics over a range of length and time scales. At long length scales the cytoskeleton must be stiff to resist deformation and maintain the structural integrity of the cell, while at short length scales the cytoskeleton must be soft to allow intracellular cargoes to move efficiently through the cellular space. My lab seeks to understand the molecular mechanisms by which the cytoskeleton tunes its dynamic mechanical properties to perform disparate structural and transport roles in the cell. Optical trapping in living cells, adapted from Hendricks et al. (2012) PNAS.